Some days, running in the Peak District requires map and compass skills. Some mornings I draw back the curtains to reveal cobalt blue skies. Today was one of the former. After a hard race yesterday I had planned a steady run today and when I saw the forecast of hill fog in the Peak District I decided to have a run on the higher ground and do some navigation practice. The Edale Skyline is a tough fell race early in the season with a notorious section over bleak terrain to Brown Knoll which is difficult to navigate in poor visibility. Today the conditions were perfect for honing navigation skills over this ground – also perfect for getting lost if you weren’t concentrating! 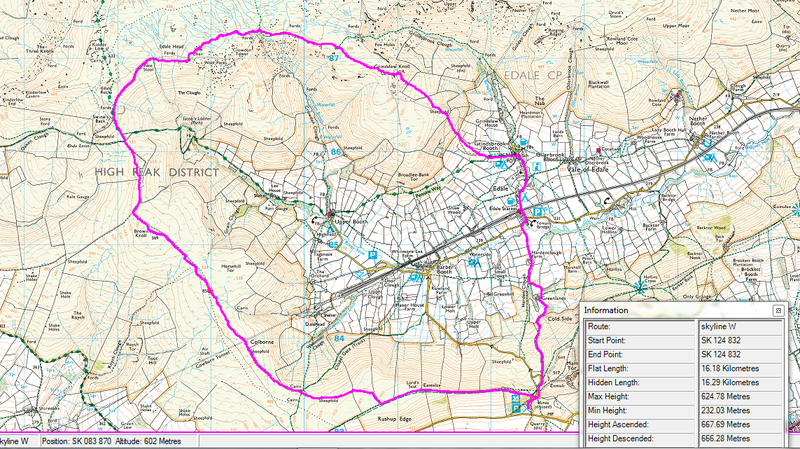 I parked at Mam Tor and set off up Rushup Edge along the good path rising westwards to Lord’s Seat. Visibility was good at this point but looking up to the higher ground to the north-west a grey blanket smothered the hilltops presenting a dreary site. Dropping gradually off the highest point on the edge I left the main path, swinging right to follow an old wall for a short while to cross the Chapel Gate path. Then leaving the security of the handrail it was off into the gloom, but first taking a compass bearing to see me across the featureless ground. Visibility was less than 100 metres and with a reduced horizon disorientation a real possibility so I ran with compass in hand, constantly checking that I wasn’t straying from my intended direction of travel. The 500 metres up to Brown Knoll is wet even in summer and today’s quagmire necessitated numerous about turns in order to negotiate the line of least resistance and avoid sinking knee deep into the morass. I had an inkling that I was close to the high point but I didn’t see the trig point of Brown Knoll until I was almost upon it. It stood marooned, a concrete island alone in a sea of liquid peat. Eerily I heard voices and expected to meet others, to share a word and the unspoken respect between those who wilfully eschew the comforts of warmth and security to visit such barren places on days like these. But the voices faded, no one appeared and so I pressed on, wondering. Leaving the ghostly pillar I negotiated the remaining bog and gained firmer ground – a new flagstone path leading to the head of Jacob’s Ladder. Navigation was easier now as I climbed past Swine’s Back and on up to the southern rim of Kinder where first the Noe Stool and then the Pagoda near Pym Chair loomed out of the gloom as I approached. I cut the corner here, deliberately avoiding the Woolpacks and relying on my compass to take me north to pick up a deep grough – where the peat has been eroded down to the bedrock – and across to the head of Crowden Brook. Westwards now on the good perimeter path I headed towards Grindslow Knoll which was just visible, in and out of cloud as I approached. Grindslow Knoll offers fantastic panoramas, standing loftily above Edale as if a guardian to the north-west. I look back towards Kinder, my route obscured, still under its sodden shroud but to the east, across the valley I could make out Ringing Rodger, Scylla to Grindslow’s Charybdis, guarding the eastern flank of Grinds Brook. Navigation over I put the map and compass away and headed down into Edale, the concave slope giving a steep rough descent through bilberry before the gradient eased as I left Access Land and gained the close cropped fields. I emerged at the Nag’s Head, famously the starting point for the Pennine Way, and resisted its welcome, turning right and trotting down the road and under the railway. Tired now, the previous day’s exertions making themselves felt, I faced the final leg, a tough uphill on the south side of the Edale Valley passing through Greenlands to emerge on the road below the ramparts of Mam Tor. Safely back, I reflect on a good trip made enjoyable by the challenge of running whilst navigating over tough Peak District terrain. My blog has recently been added to Running Blogs, which is part of one of the largest networks of blog directories on the Web. Please visit my blog’s personal page to vote for my blog and comment to other blog users.